In a world of uncertainty, it's nice to have some rules. The Associated Press Stylebook provides them - well, at least the rules about grammar, spelling and style. 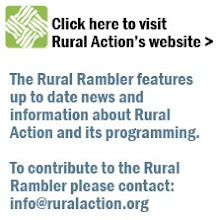 The book is an essential tool in helping Rural Action maintain a professional image. If you're a journalism professor or student with access to a slightly out-of-date copy of the Stylebook, we'll gladly trade it for our extremely out-of-date edition. Or, if you'd like to spring $11.67 for the newest version, well, we'll take that, too.